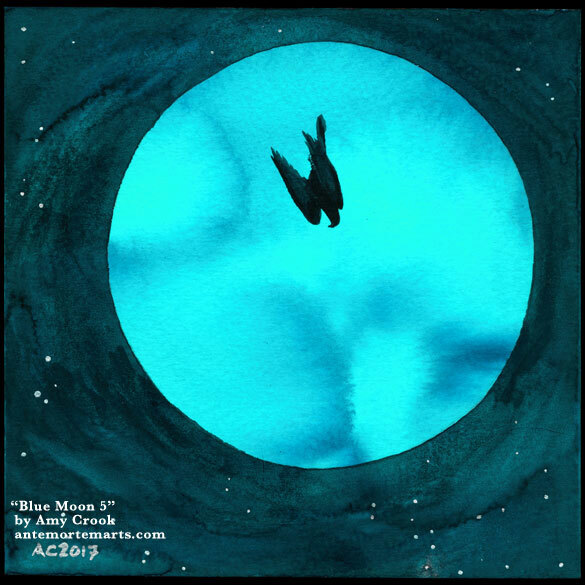 Every painting in the Blue Moon series is vastly different, and in that much this one remains consistent with its predecessors. 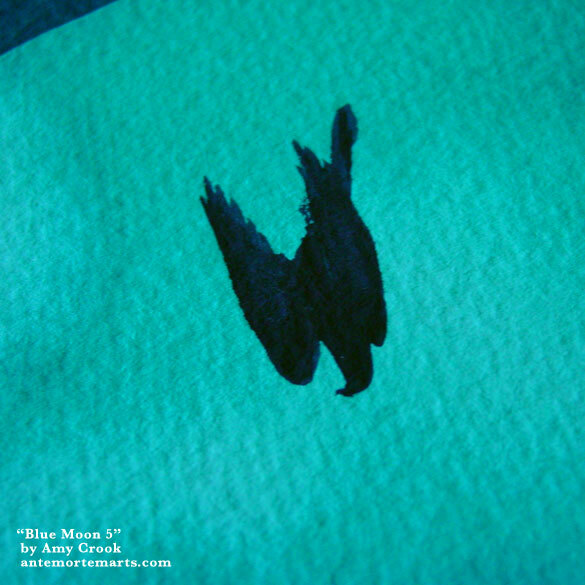 Photos can’t do justice to the deep, rich teal and turquoise of the moon and sky here, the ink bringing a glowing clarity to the colors that just doesn’t come through on a monitor. Shining silver stars dot the sky around our big blue moon, and an osprey dives through the light on its way to get its unfortunate prey. What are you saving for a blue moon? 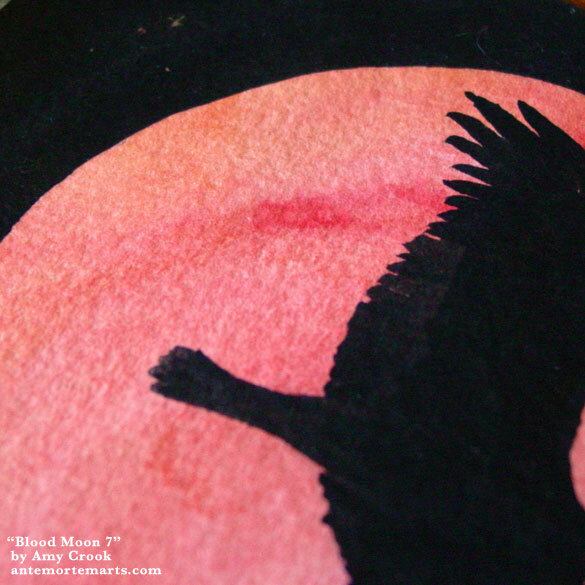 Above, you can see the diving raptor close up, all the detail of beak and feather against the blue moon. Below, the painting is in a frame, resting up for its long journey home. 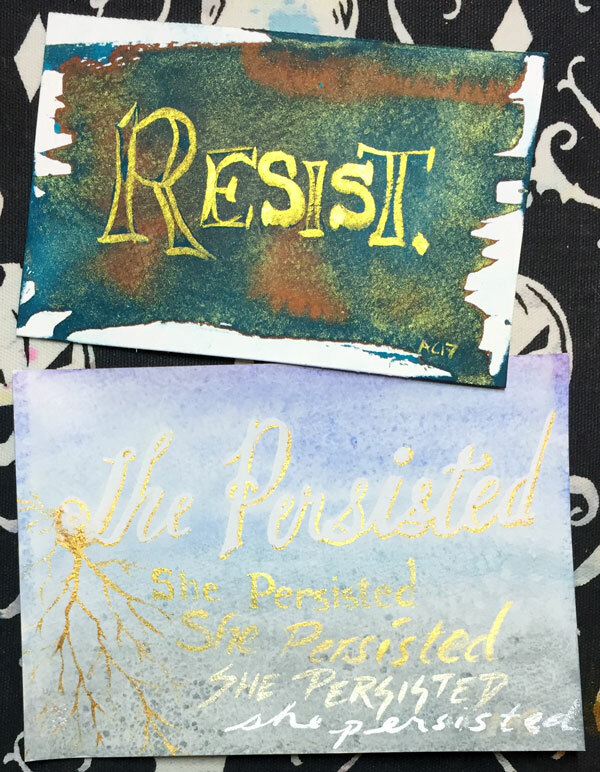 I painted these this past week to try out some of my art supplies and I think they both do a good job of what they were meant to do — defy those who wish to shut us up. 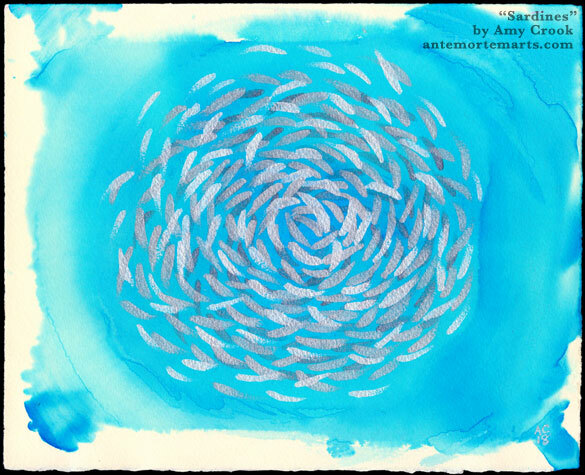 Want one of these gorgeous originals? Normally they’d go for $199 and $249 respectively, but if you make a donation of at least $50 to NAACP, you can keep whichever one you wish. * Help them keep fighting the fight they’ve been fighting for years, email me the receipt, and I’ll get your defiance out to your doorstep. 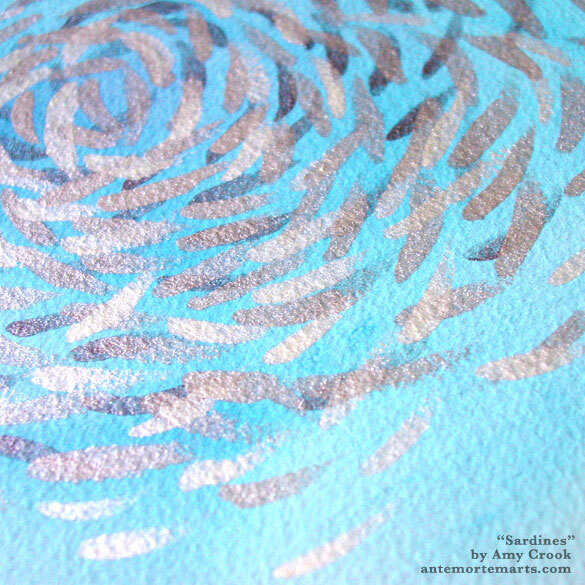 Both of these have beautiful metallics and sheen to them that’s even more amazing in person. Take them home, donate to a good cause, and make your own resistance that much more beautiful and truthful. *First come, first snagged. First class shipping is included via letter post, if you want fancier shipping there will be an additional charge for the exact fee. 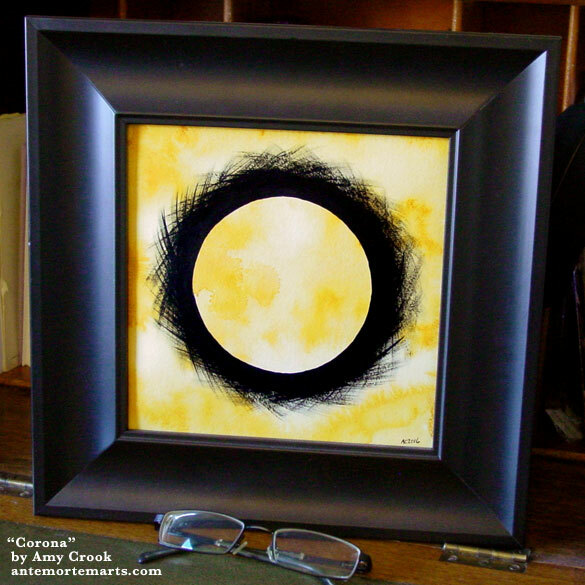 Like the inverse of a sun in eclipse, this dark corona shines out of a golden disk, creating an image almost like a crown of thorns or a winter wreath. 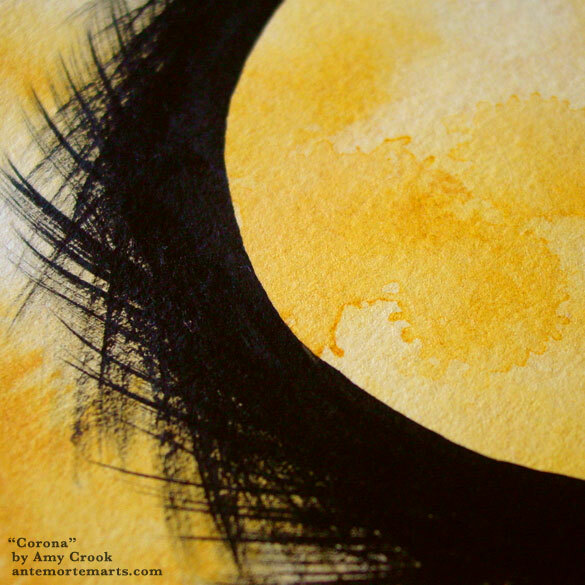 The rich golden hues are hard to reproduce, but they make a striking contrast to the dark, opaque black. This piece looks amazing in a dark, wide frame, contemporary and dramatic, a perfect painting for a spot that needs a statement. 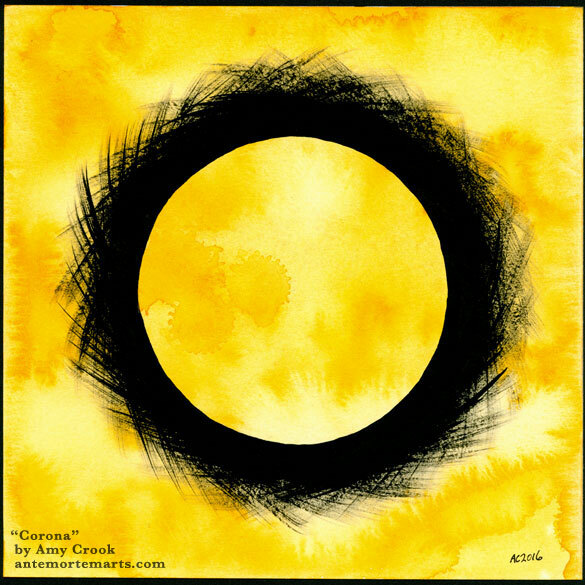 Above, you can see the rich golden-yellow background, and the darkness of the black brushstrokes creating the strange halo. 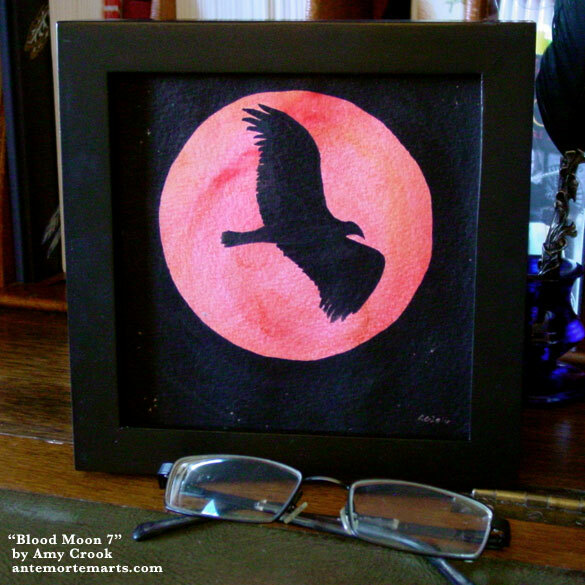 It’s been put in a beautiful frame below, striking and elegant. 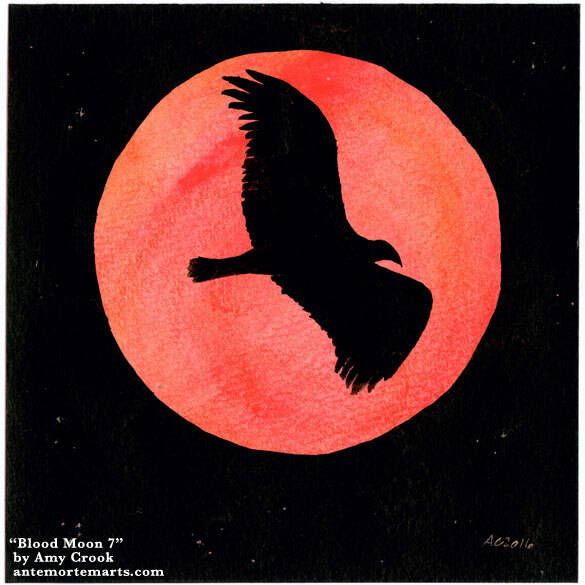 An impressive wingspan gives the bird a gorgeous silhouette against this rich, golden-red blood moon. There are subtle copper stars twinkling in the black sky, and the whole image holds the rich texture of the paper it’s painted on. The dramatic red and black would be beautiful in a wide black frame, but even in the narrow one in the photo it really makes a statement. Where in your life do you need wings? Above, you can see a close-up of the texture of feathers, of the surface of the moon, and the twinkle of stars out in the space beyond. 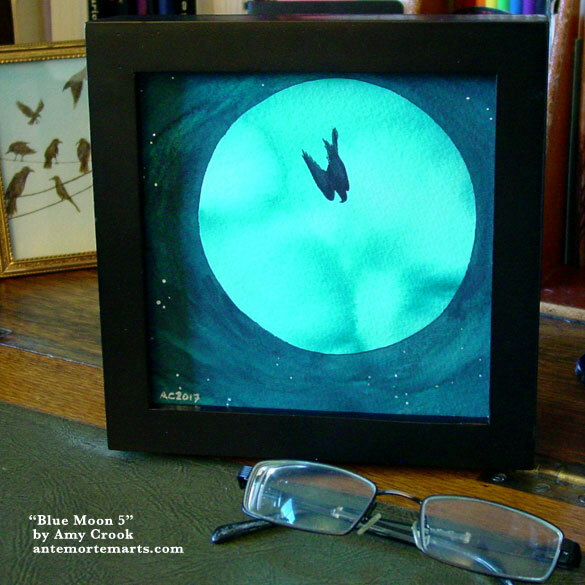 Below, the small frame beautifully contains this dramatic work of art. 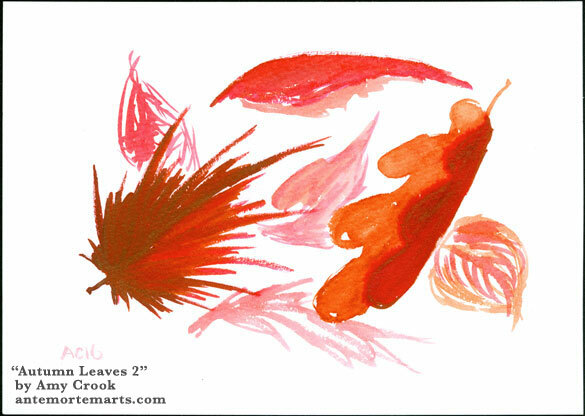 A motley of red autumn leaves tumble in the breeze on this loose, lovely ink painting. 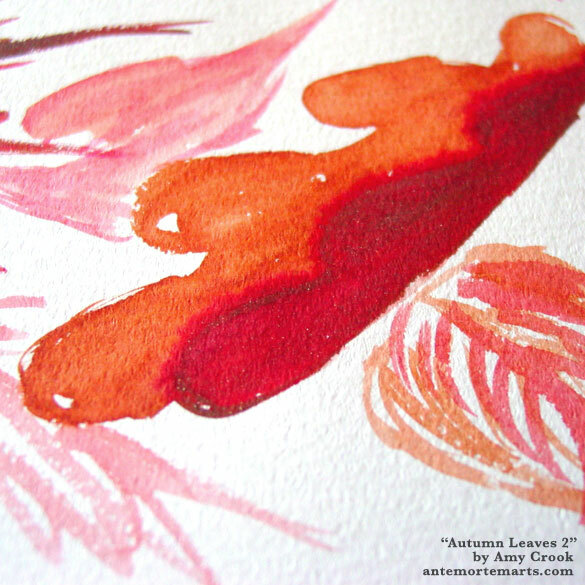 The colors range from soft reds to warm golden browns, getting lighter and looser as they fade into the background. Oak and maple, aspen and apple, they celebrate the glory of fall. 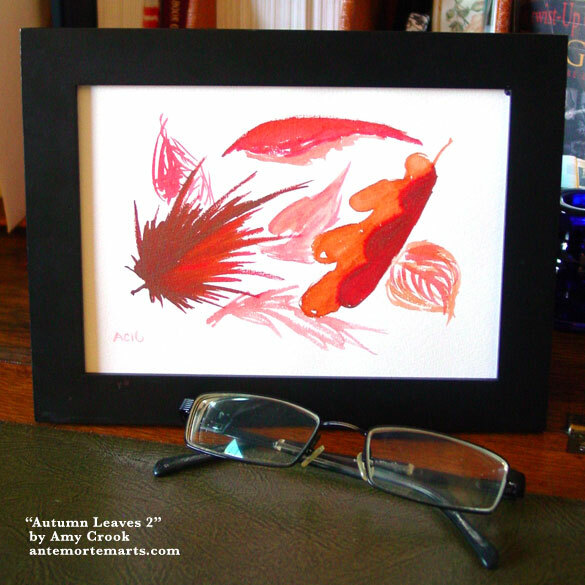 Above, you can see the rich ink glow against the white paper, this oak leaf evoking all the colors of fall. 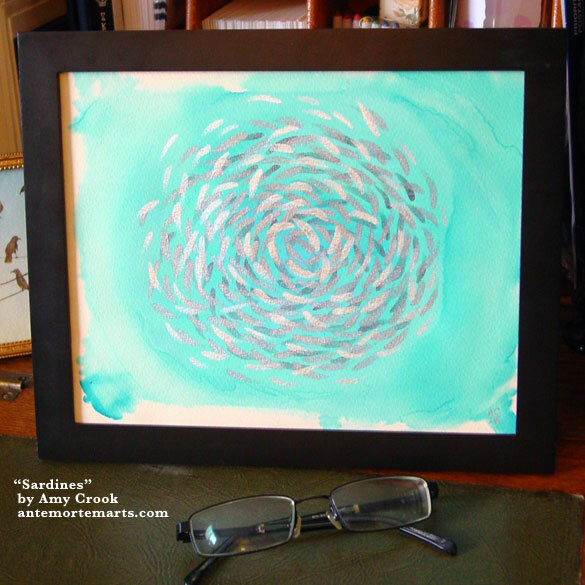 Below, the piece is displayed in a frame, safe from the vagaries of wind and winter. 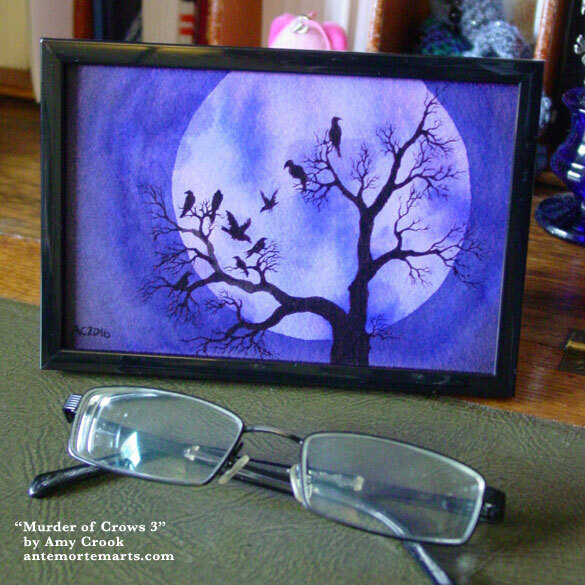 Blues and violets and soft lavenders glow against the rich black of the tree and crows, the sky softly textured as if with a mist that’s parted to display the shining moon in all her glory. 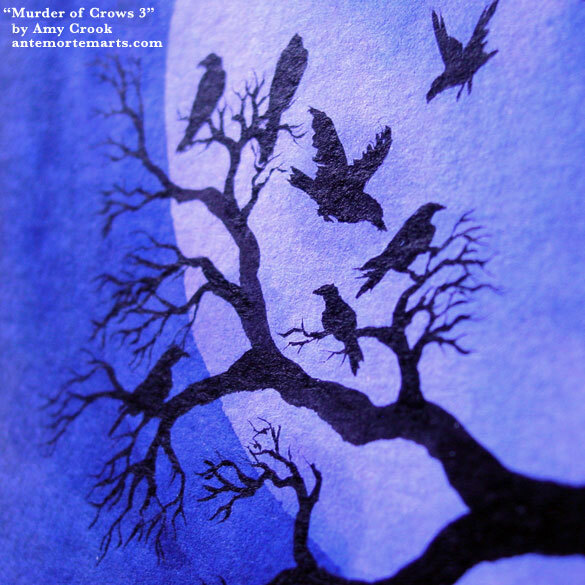 Nine dark crows are coming to roost in the sparse winter tree, its branches ravaged by some accident of the past, lightning or storm or some other act of man or nature. A full moon brings clarity and insight with it, shining its light into all the branching processes of your decisions and thoughts. 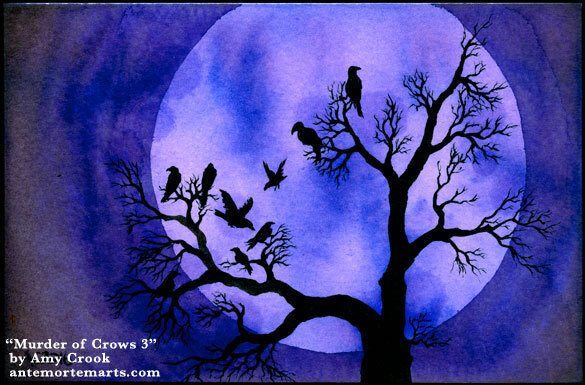 Above, you can see the blue midnight sky, glowing violet moon, and deep black of the twisty tree and gathered birds. Below, it’s in a temporary frame, just waiting to fly to its new roost.